Edwin Newman was born in 1803 in Milborne Port, the son of Edwin Sandys Newman (1762-1836), Rector of Shepton Beauchamp and Sparkford, originally from Leicestershire, and his wife Frances Tucker née Lyde. Edwin Sandys Newman was educated at Rugby School and Magdalene College Cambridge, gaining a Bachelor of Laws there in 1791. He was rector of both Shepton Beauchamp and Sparkford from 1798 to 1836, curate of Babcary 1804 to 1836, and died at Babcary on 19 April 1836 aged 74. Edwin Jnr was educated at Sherborne School and attended the school around 1815 and later sent five of his sons there between 1837 and 1844. On 15 June 1821 Edwin, at that time living at Babcary, entered into articles with James Parsons, attorney and solicitor of Somerton, for a period of five years. Edwin's father was the younger brother of Francis Newman who, just a few years before Edwin's birth, had absconded to the USA after squandering the family's fortune. Perhaps as a consequence of this, Edwin became the first in his family to take up a profession outside of the Church, and the first to start his own business. On 19 April 1828 at West Coker, Edwin married Charlotte Jekyll, daughter of Rev George Jekyll (c1777-1843) of West Coker and they were to have 12 children born between 1829 and 1849. Charlotte was the sister of Nathaniel Jekyll, also a solicitor. Pigot's Directory of 1830 listed Edwin as an Attorney of Vicarage Street. In the 1832 poll book Edwin was recorded as living in Vicarage Street and was on the electoral register by virtue of owning several freehold properties in Belmont, newly built by Peter Daniell. He was a member of Yeovil's Vestry and became a Town Commissioner in 1830 and he started a legal practice in Yeovil around the same time and he was listed in Pigot's Directory of 1830 as a Yeovil solicitor, one of seven such firms in the town at this time. By 1839 he was in partnership with Thomas Lyon and their company was called Newman & Lyon until at least 1875 (at which time Edwin was 72 and Thomas was 61). In 1831 there were riots in England when Parliament decided against reform to give Britain's industrial cities and towns better representation. Many of the solicitors in Yeovil were active anti-Reformers and had been professional election agents of Lord Ashley. Consequently these were the first to be singled out by an angry mob on the night of Friday, 21 October 1831, in what was to become known as the Yeovil Reform Riot of 1831, who attacked the home of John Newman as well as the homes of Francis Robins, William Lambert White, John Slade and Edwin Tomkins. The following is an extract from the 5 April 1832 edition of the London newspaper, True Sun, reporting on the trial of the rioters at the Taunton Assizes of 3 April 1832 "James Martin, aged 15, Thomas Dommet Symes, 25, J Gill, 27, and Henry Erl, 36, were indicted for having riotously assembled on the 21st of October last, at Yeovil, and beginning to destroy and demolish the dwelling house of Edwin Newman. Mr Ball appeared for Gill. Mr Moody conducted the prosecution, and called the following witnesses:- Edwin Newman, an Attorney at Yeovil - "On Friday, the 21st of October, at eight o'clock in the evening, there was an assemblage of about fifty people opposite my house. They threw stones at the house, but the trees in front protected it. They stayed for ten minutes to a quarter of an hour. About half-past eleven, a violent mob, consisting of several hundreds, came to my house. They attacked the front gate, shouting and making a noise. After much labour and pains, they got through into the yard. They then violently attacked the windows and doors with stones and sticks. They broke down the office window; they got in, whereupon I moved from the front door where I had required them to desist, and told them I have a loaded pistol and would fire on them. I went to the inner door of the office, and stood there. I said, "You have broken my widows, be satisfied and be off." and assured them if they made their appearance I would draw the trigger of my pistol which I held in my hand. During that time another party were endeavouring to break in my front door. Hearing the screams of my wife, who was upstairs with her two infant children, she being at that time in a very delicate situation, I left the office door and went to her. I then heard them break in the front door. Mr Tomkins came in, and entreated my wife to leave the house. She refused, unless I would join her: at last I accompanied her and the children. They were breaking the furniture all over the house. In going out I passed the front door; it was completely broken. There were several hundreds collected. I went back to my house between four and five the next morning. I then found the doors, shutters and windows battered completely to pieces. There was only one pane left in front. The framework was entirely demolished. I was obliged to have a new office door. At the back of the house, the dining room windows ands frames were entirely broken and destroyed. The furniture was injured to a considerable amount. I have recovered a verdict against the hundred for £250 (about £20,000 at 2014's prices). I was engaged by Lord Ashley at the Dorset election." Cross-examined by Mr Bell - "I was a very active agent for Lord Ashley. Persons who were innocently looking on, might have been pressed into the court." Other witnesses were called, who corroborated Mr Newman's testimony, and recognised the prisoners as having been actively engaged in the outrages detailed. No evidence was called for the prisoners, against all of whom a verdict of Guilty was returned. No sentence was passed." Edwin bought Hendford Manor in 1840 and the Somerset Gazette Directory of that year recorded him as an Attorney of Hendford. in the 1841 census, at the age of 35, he was listed as an attorney living there with his wife Charlotte née Jekyll aged 30, their three children, an articled clerk and two servants. At the time of the 1851 census Newman was at his club in Tavistock Row, Covent Garden, London, but Charlotte and five of the children were listed at Hendford Manor with an articled clerk, a lady’s maid, cook, footman, housemaid and a nurse for Newman’s 2-year old daughter Henrietta. Newman's growing family of twelve children necessitated later extensions to Hendford Manor; a plain north wing of cut and squared local stone with eight rooms was added, together with a large dining room on the south side. 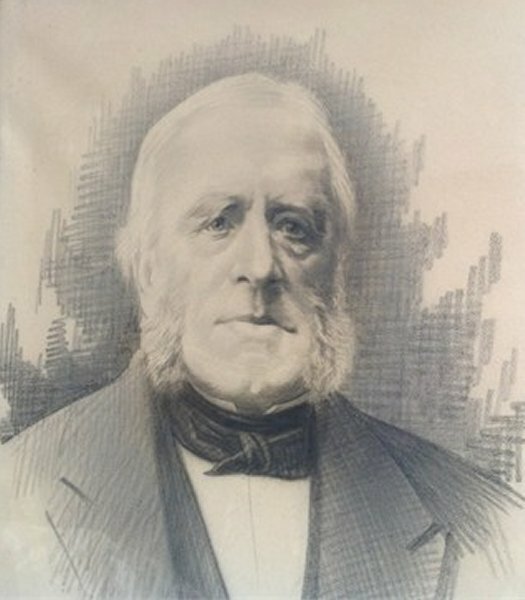 At least three of his sons were to follow him into the legal profession; his eldest son Edwin born 1829, William born 1832 and Charles born 1841. It is presumed that all three were articled to the firm and at least one of them, Charles, was to become a partner working from the firm's London office. In 1854 Edwin was listed on the Burgess Roll. In the 1861 census Edwin and Charlotte were listed at Hendford Manor but only two of their children, son Edwin aged 32 and a solicitor and undergraduate Charles aged 19, were living with them as well as butler Henry Durlin, a cook, kitchen maid, seamstress and a housemaid. By the time of the 1871 census Edwin and Charlotte had their son Rowland living with them, he was aged 25 and was the officiating minister of Lufton. Charlotte died in the spring of 1875 aged 68 and in 1876, Edwin married 65-year old Catherine Augusta Paynter née Coleman, widow of Francis Paynter. The marriage took place in the remote village of Brompton Ralph in west Somerset not far from Exmoor, and resulted in his new wife's son, Henry Augustus Paynter (husband of his daughter Henrietta) becoming not only Edwin's son-in-law, but his step-son as well. Henry's brother, James Bernard Paynter, was a partner in the law practice. Edwin suffered a severe financial blow in 1880 due to his head clerk making off with the firm's funds. Newman's second wife Catherine died in September 1880 and in the 1881 census Edwin was recorded as a 77-year-old widower and gave his occupation as solicitor. He was living at Hendford Manor with his granddaughter Charlotte, his butler Henry Durlin who had served him for over 20 years, a cook, kitchen maid and housemaid. Edwin Newman died on 22 January 1885 aged 82. His personal estate amounted to £31,189 (approximately £13,700,000 at today's value). There is a memorial tablet to him in Holy Trinity church but he was buried at Lufton. Edwin Newman's signature against the Vestry minutes of 27 August 1835. The development of Edwin Newman's law firm was somewhat complicated. As seen above, he started the law practice on his own, probably around 1826, in Vicarage Street. 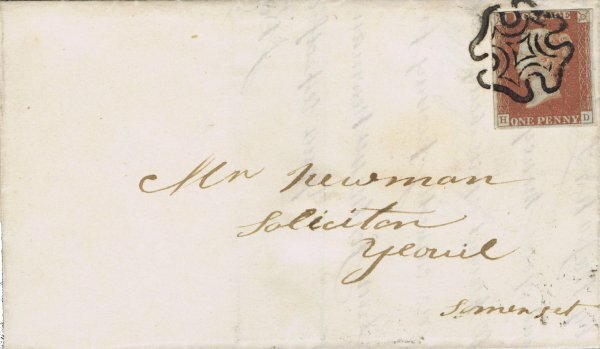 By 1839 he was in partnership with Thomas Lyon and their company was called Newman & Lyon until at least 1855 by which time (evidenced by the envelope shown below) the firm was known as 'Newman, Lyon & Newman'. The second Newman is unknown, but presumably was Edwin's eldest son, also called Edwin. From 1840, when he purchased Hendford Manor, until at least the 1950s, his firm and its descendants were based at Hendford Manor. The firm of Newman & Lyon would have ended with Thomas Lyon's death between 1877 and 1881. Edwin took on a new partner, John Locke Jeans, and the firm was listed as Newman, Jeans & Co., Solicitors of Hendford in Whitby's Yeovil Almanack Advertiser of 1882. Additional new partners were taken on and the firm was renamed Newman Jeans Paynter Newman and Gould, being listed in 1883. The partners were Edwin, by this time aged 80, John Locke Jeans, James Bernard Paynter, Charles Octavius Newman (Edwin's son) and Frederick JM Gould, aged 26. Following Edwin Newman's death in 1885, the firm was called Newman Paynter Gould & Williams. At this time Charles Newman was aged 54, James Paynter was 45 and Frederick Gould was aged 38. The new partner was Edward TL Williams. This structure of the firm was certainly listed in 1895. By 1898 however, Whitby's Yeovil Almanack Advertiser listed it as Newman, Paynter & Co which was repeated in the 1903 edition. I'm not sure what happened to Frederick Gould in the meantime, but by 1914 the firm was listed as Newman Paynter Gould & Newman. Charles Newman was by now aged 70, James Paynter was 64, Frederick Gould was 57 and the new partner was Charles' son, 50-year old Walter E Newman. The composition of the firm remained unchanged until at least 1919 when it was listed in Kelly's Directory. By 1923 the firm's composition had changed yet again since Charles Newman had died and the firm was listed as Newman Paynter & Co once more. It was listed as such in Kelly's Directory of 1935 and was listed, for the final time, in Edwin Snell's Directory of 1954. 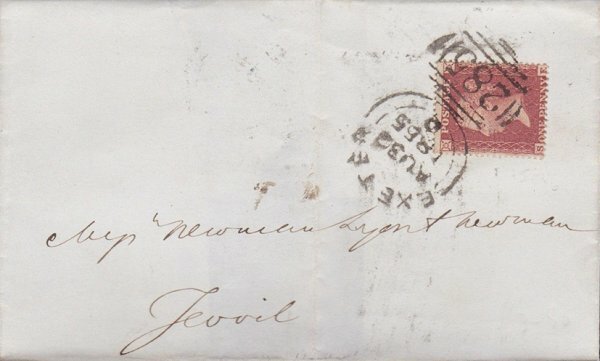 An envelope, posted from Blandford and dated 6 April 1841, addressed to Mr Newman, Solicitor, Yeovil. 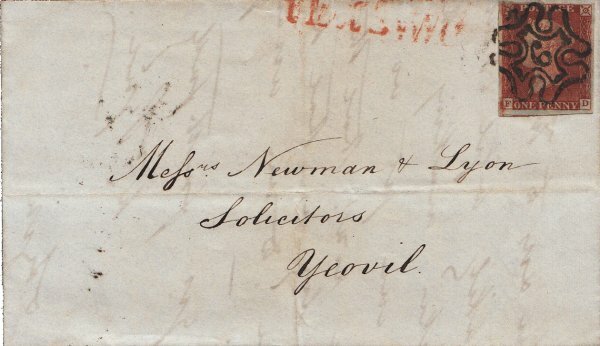 An envelope, posted from London and dated 4 April 1844, addressed to Newman & Lyon, Solicitors, Yeovil. By 1855, the date of this letter, the company was known as 'Newman, Lyon & Newman'. 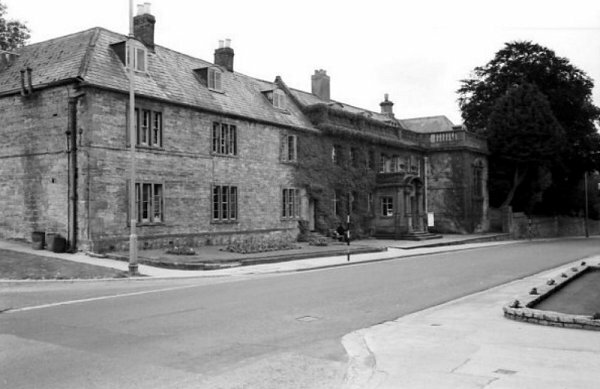 Hendford Manor, photographed around 1960. Edwin Newman's extensions are the three bays at left and the protruding dining room at right. Pencil sketch of Edwin Newman.